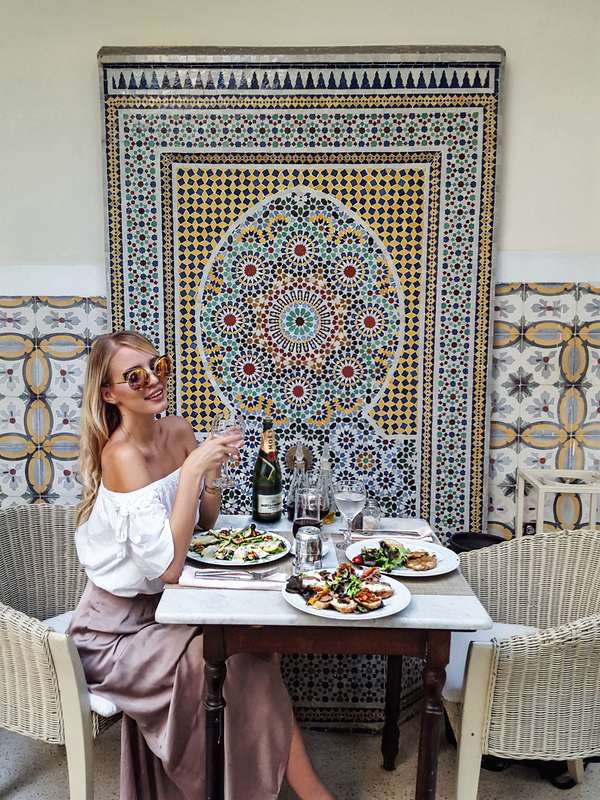 It took me a little, but I finally updated my Marrakech travel guide to share with you all the places I truly love and recommend after visiting Marrakech twice! 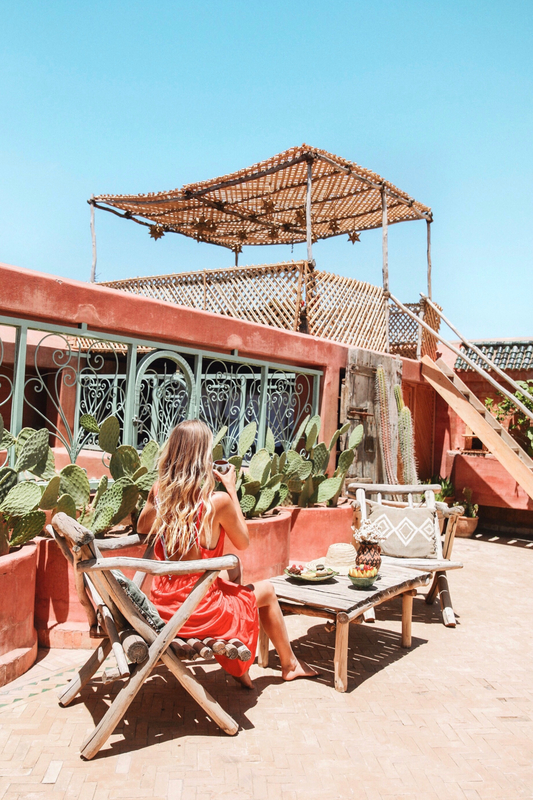 When I went to Marrakech for the first time, I became obsessed with the break taking architecture as well as the hospitality and I wanted to discover more of Marrakech’s colorful charm. I truly left Marrakech heartbroken and curious and felt like I have to come back to get even more inspiration from this special place. 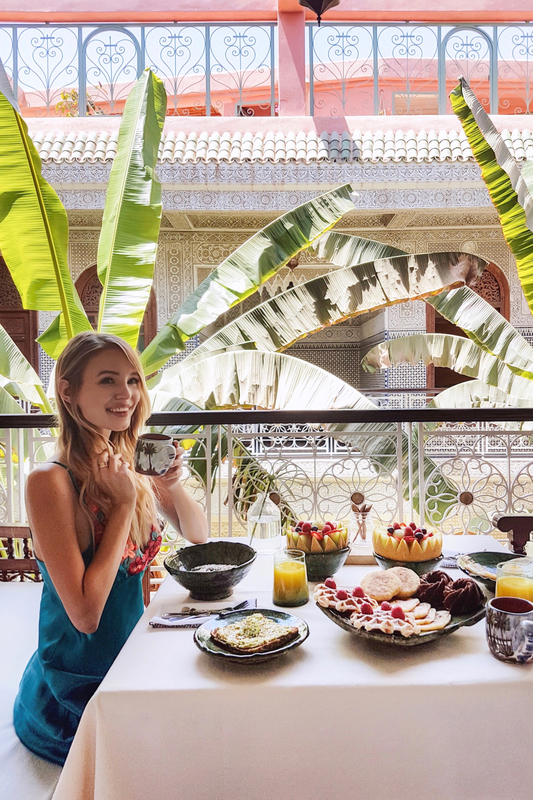 Therefore, I revisited Marrakech after only a few month and today I can finally tell you more about my most loved places, hotels, Riads (my favorite thing about Morocco) and food places. For two nights I decided to stay in a Riad in the middle of Marrakech and it was such a good decisions. I’ve heard of Riads before but I’ve never visited one before. From outside you have no clue what beauty will hide inside when entering the doors. 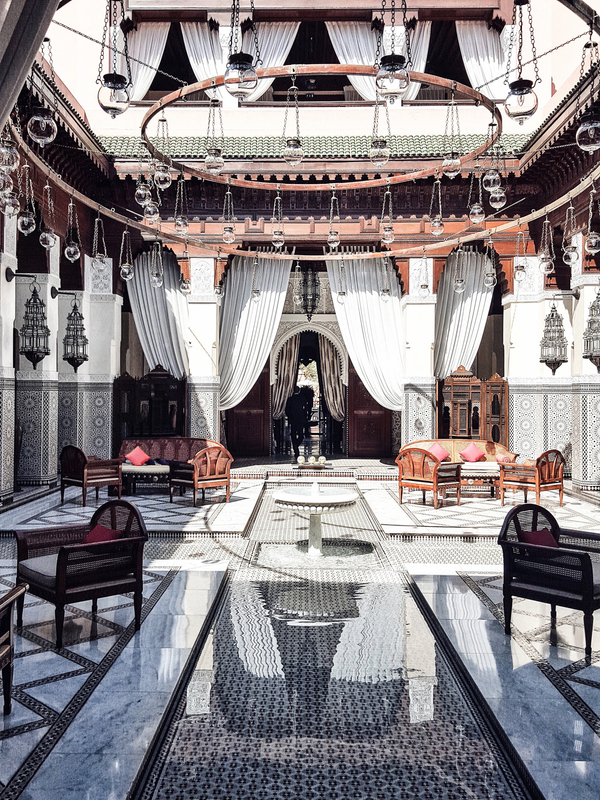 You are outside on the vibrant streets of Marrakech and you open the doors to find the most beautiful oasis. 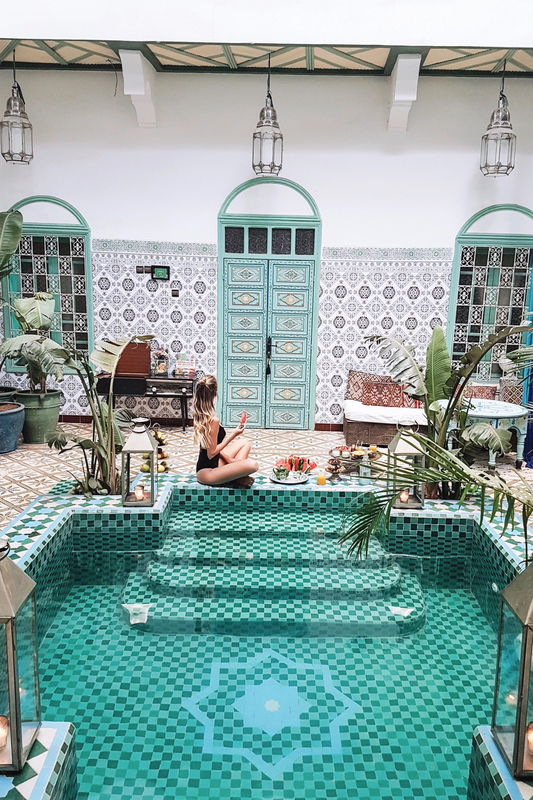 I found Le Riad Yasmine on Instagram (I plan most of my getaways with the help of social media – It really inspires me and gives me a good and honest impression!) and it was just too charming. 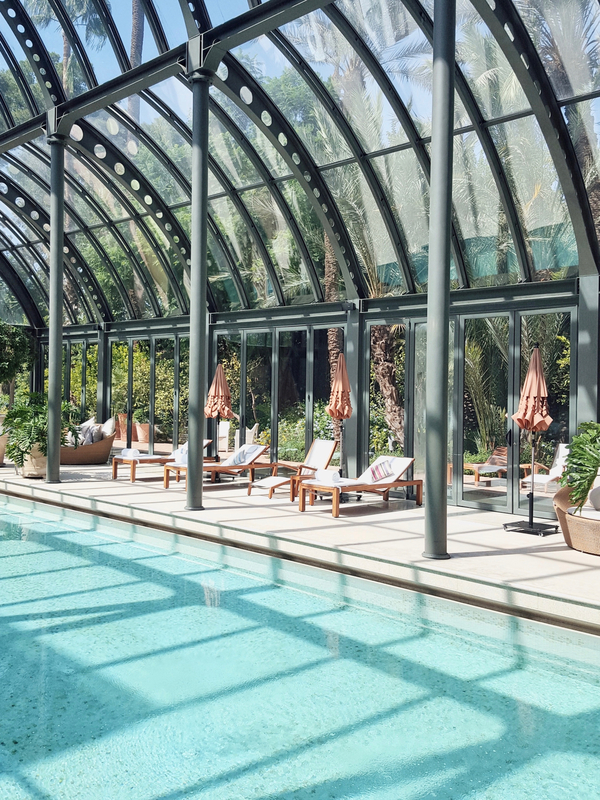 The rooms were built around a cute mosaic pool and they serve the freshest food in the morning. Only a baby cat would join you when hanging around the pool area and I was super happy when the Riad owners provided me with their pink room. 😉 I also looooved the rooftop, it was super huge and you could enjoy the sun or the warm evening hours. From all places I’ve seen in Marrakech, Riad Le Jardin Secret was the one which touched my heart the most. 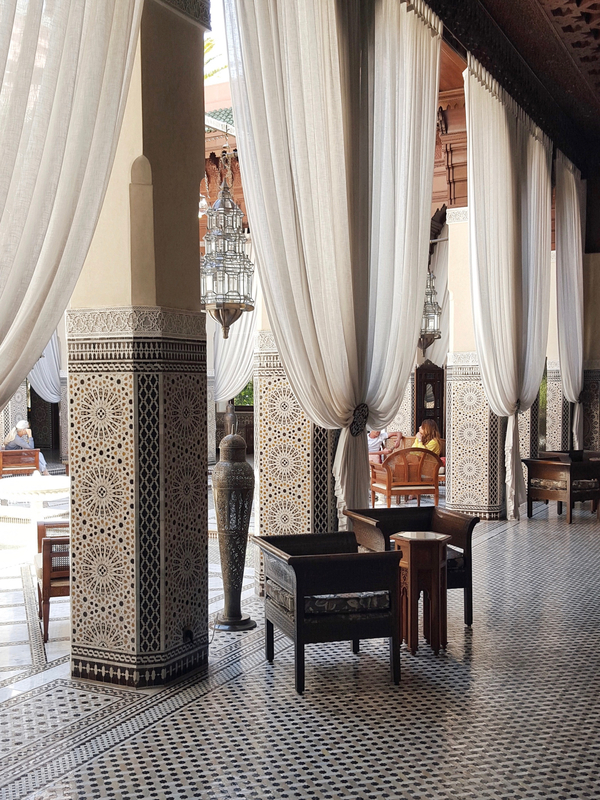 I already loved the impressions I found online, but being at Riad Le Jardin Secret and feeling the vibe melted my heart. 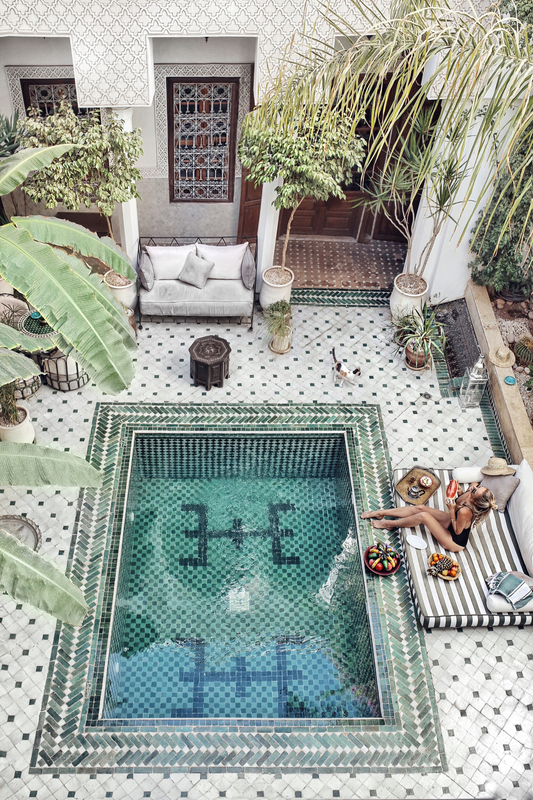 The owners of the Riad are a cool, layed back couple with an incredible sense for architecture, interior and colors. I loved every corner of the Riad! 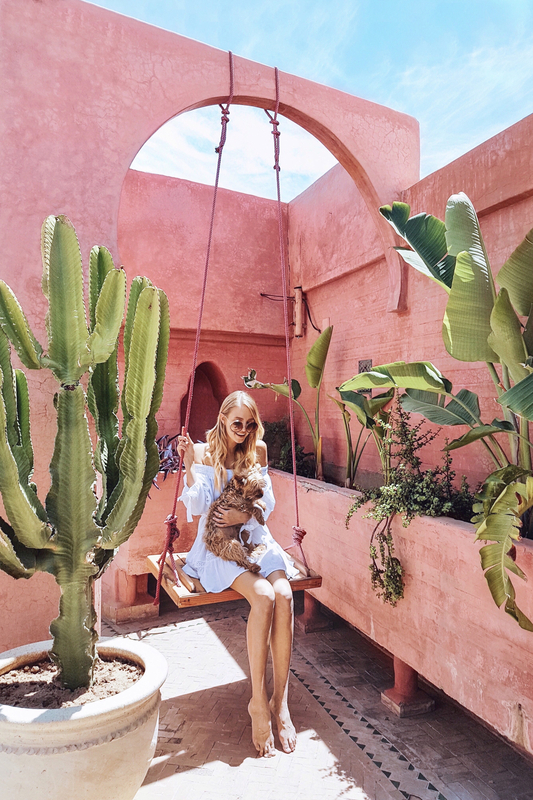 The two little dogs, the pink shades, the beautiful palm trees, the decoration, the swing, a natural shower… every corner is magic! And when I thought I could love this place more, they served me the breakfast of my dreams! A watermelon filled with fruits, avo, freshly baked goods and everything was so tasty and rich! As the menu was slightly changing every day, I was always keen on waking up and seeing what would be next on the list. Do I sound like a fan? Well, truly am! ?? 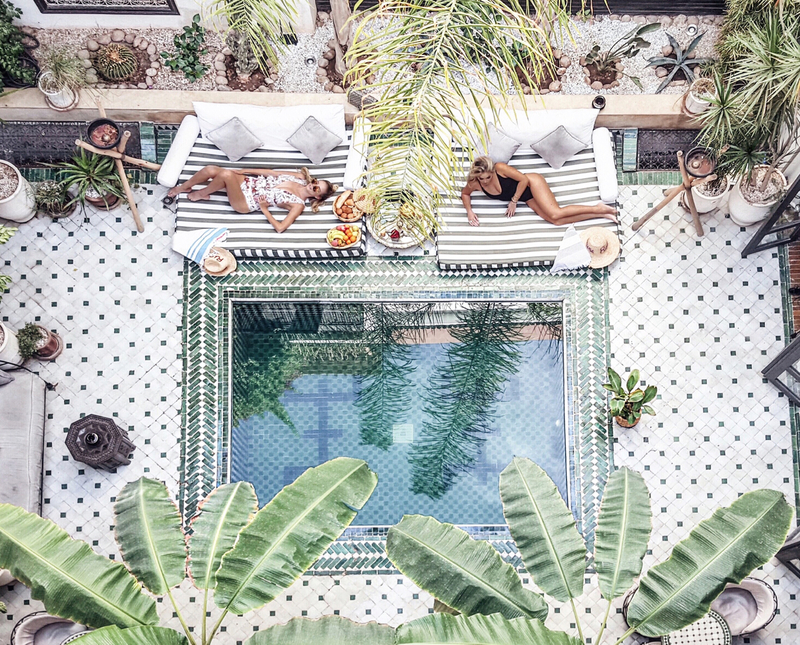 I visited Riad BE because I’ve been fascinated by the colorful pictures I found online and the Riad was just as cute as I figured from what I saw before. 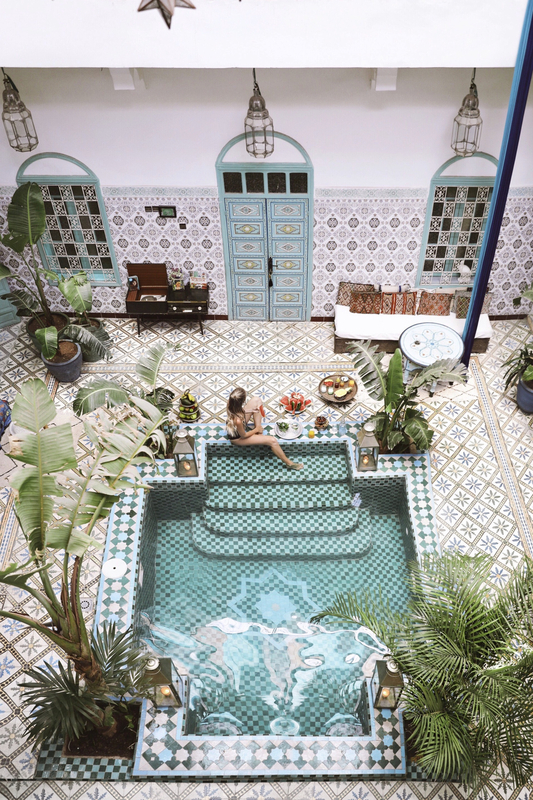 The Riad has a colorful pool area and a cute rooftop with a little turtle crawling around. Alex and I only visited for one morning, but the food was soooo good! If Riad BE wasn’t fully booked we would have stayed longer! Well, yes, I did a little hotel and Riad hopping and it was totally worth it. 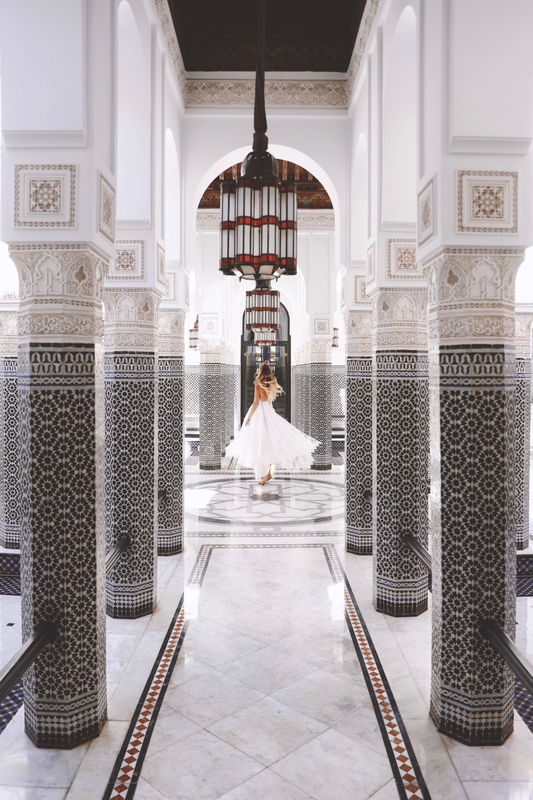 When I arrived at Royal Mansour I felt like a princess. We had the most spacious private Riad with a little pool on the rooftop. But what I even liked more were the breathtaking entrance area, the restaurant area and the spa! It was a magical all white dream! One night we were invited to try the traditional Moroccan restaurant and even though I have the taste of a six years old, the food was soooo tasty! Probably the best food I had in Morocco! And that is such a big compliment, because I’m such a sweet tongue and these super sweet Moroccan sweets made of honey and nuts give me life. 😉 Thank you for being the perfect hosts, I will never forget this amazing experience! One of my favorite things about Marrakech are all the cute rooftop restaurants which allow you to watch the sun set in the most beautiful surroundings, enjoying the endless hospitality of the Moroccan people. I visited the Insta-famous Nomad and the Café Atay and I’ve been obsessed with both places. Nomad is located above the Souks so that you can stroll around the carpet and spice places and have some delicious and modern Moroccan cuisine with a view afterwards! For an early dinner we quickly headed to Il limone which was just around the corner of Riad Yasmine and it was such a beautiful typical Moroccan place. You simply cannot visit Marrakech without getting lost in the pinkish corners of Marrakech and especially the old town Medina. I loved looking at all the carpets, spices and cute lamps. There was so much to discover! One of my favorite places was Ben Youssef, such beautiful architecture. Ich kann deine Begeisterung also vollkommen nachvollziehen! Zu den Bildern fällt mir nur ein Wort ein – ZAUBERHAFT! Wow die Fotos sind so beeindruckend! MEGAAAAAA Wie in einem Bilderbuch, ohne Witz. 😀 Oder in einem Luxus-Travel Katalog. I would love to take the sunnies around Italy: I’ve always been dreaming of eating gelato while walking to the Vatican or doing some shopping in the Galleria Vittorio Emanuele II in Mlian. And I’m not even talking about the water rides in Venice or all the pastas, cheeses and pizzas I dream about. I’m speechless!! All these photos are the most beautiful and hedonist dreams like photo diary and guide to Marrakech! Wow, die Bilder sind der Wahnsinn. Alles sieht so schön und exotisch aus. toller Beitrag. Ich möchte auf jeden Fall Mal nach Marrakesh. 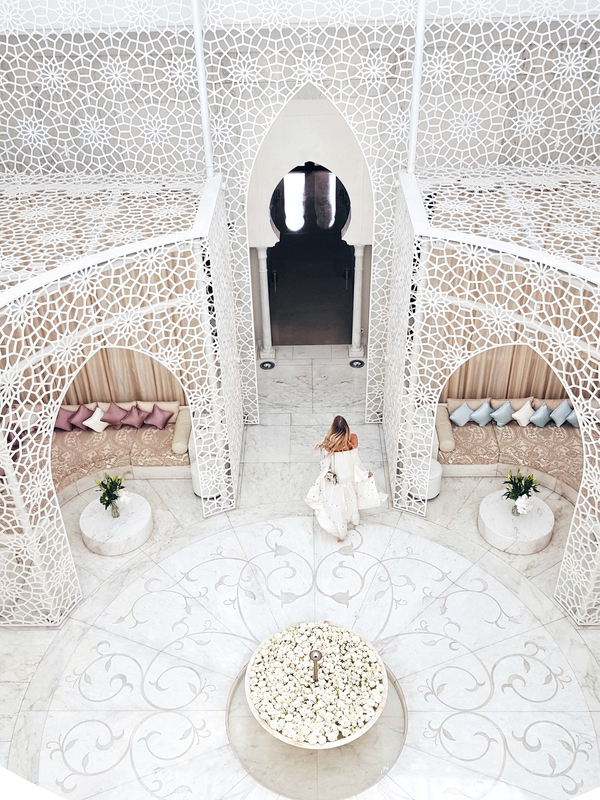 Marrakech looks stunning! Loving all the colors! Super schöne Sonnenbrille! Ich würde sie im Februar auf meine Reise nach Kolumbien ?? mitnehmen! Die Fotos sehen aus wie aus 1000 und einer Nacht. TRAUMHAFT! *-* Marrakech klingt wirklich toll, mir war gar nicht klar, dass es so wunderschön und sehenswert ist. Die Stadt kommt wohl auch auf meine Reisezielliste. Das Gefühl von Fernweh habe ich super oft nach dem Lesen deiner Posts, deine Travel Posts sind wirklich total inspirierend! Ich freue mich schon auf weitere Reisetipps von dir! Mal wieder ein wundervoller Poste! Es sieht einfach paradisisch aus! Werde es für 2018 ins Auge fassen, nächstes Jahr ist (leider) schon voll verplant ;)! Und wenn ich Sunnies von Mister Spex mitnehmen könnte, dann wär das natürlich ein Traum. Wow, die Bilder sind magisch! Bin hin und weg! Ich würde sie zum Skifahren mit in die Schweiz nehmen ??? perfekt dafür!! Wunderschöne Bilder hast du da gemacht ? Hab wegen deiner Posts das Riad Yasmine für Mai gebucht und freu mich schon riesig. die Bilder sind euch einfach unfassbar gut gelungen! Dazu kommt, dass die Locations wahnsinnig schön sind, dass ihr euch sofort verliebt habt, ist mehr als verständlich. Ich möchte auch schon lange mal nach Marrakech, jetzt noch mehr als zuvor. Sieht nach einem traumhaften Urlaub aus! Marrakech ist soeben auch ganz weit oben auf meine Bucket List gerutscht. Absolut traumhaft und grandios schöne und märchenhafte Bilder, Leonie. Wie unfassbar schön sind bitte diese Fotos?! ? ? Auf meiner bucketlist stehen (jetzt neben Marrakech!!) auf jeden Fall Tulum und Tangier noch ganz weit oben. Das wird hoffentlich nach dem Staatsexamen die dringend benötigte Erholung ? Love your snaps on Instagram! Such great colour, so fresh. Thanks for the Marrakech tips I’m going next month to escape the London winter. This would be the first spot I would wear Mister Spex before going to sunny South Australia for a visit home. Look forward to more of your posts. Marrakech is definitely on my bucket list! Your pictures are STUNNING and the colors are gorgeous! Every single photo just makes me want to dive in! Everything is so beautiful, and as to where I would like to take my sunnies: I can’t think of a better place than Morocco! The pink hue would match perfectly to the brown-pink sand 😉 As we share our love to pink of course! I love this post!I would love to take the sunnies to New York. This guide is truly amazing!! Adding Marrakech to my bucketlist right now. Thanks so much for making this! 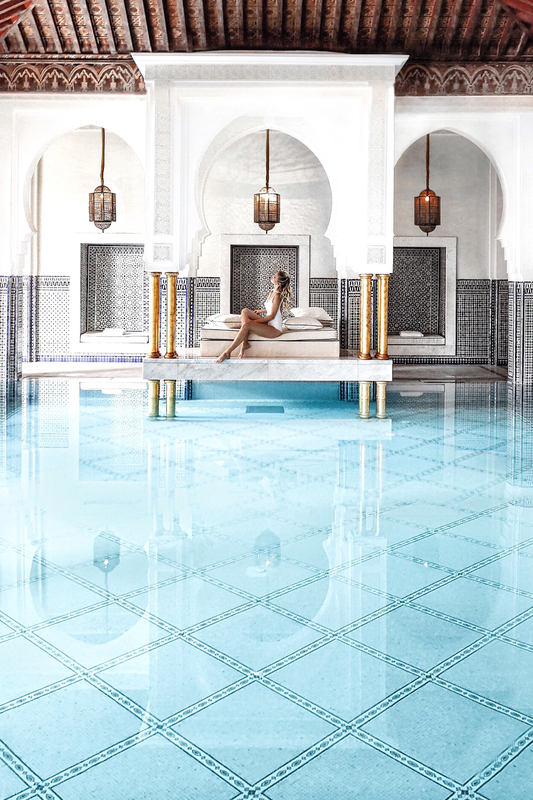 Okay, Marrakech has made my travel bucket list! These photos are incredibly gorgeous! What a picturesque opportunity! Beautiful photos and wonderful writing. I would love to go to Moracco someday. Beautiful photos and very interesting post! 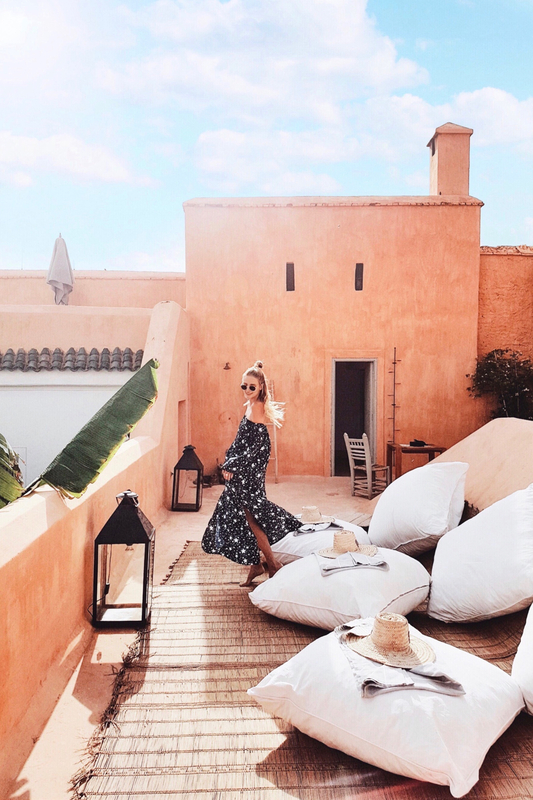 I’m going to Marrakech very soon, in June, and this tips will help me a lot to organize my days there, I will definetly check out all your recommendations! I would take this gorgeus sun glasses with me this summer, i’m gonna visit Puglia and Rome in Italy and like i’ve already said Marrakech. Hi! Loved this post! 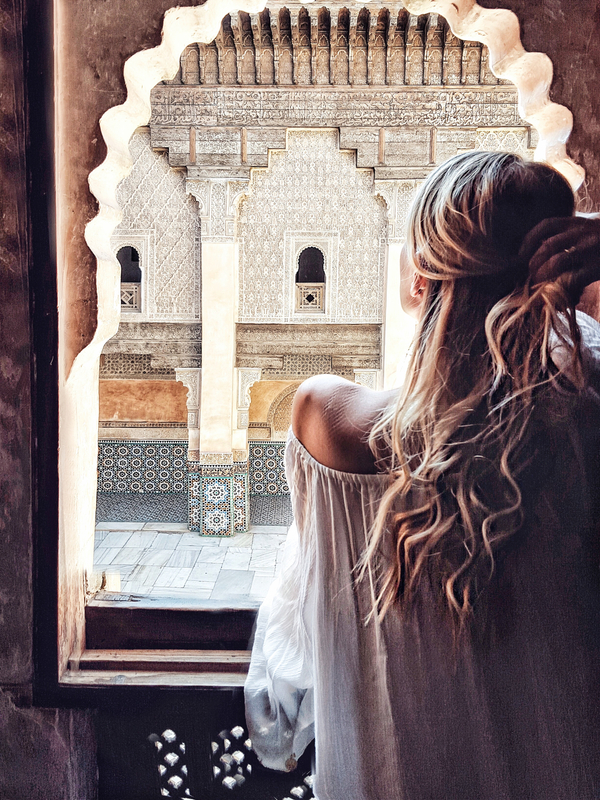 I am going to Morocco this summer — to Marrakesh, Casablanca, Fez, and Chefchouen! I noticed in your photos you had some shorter dresses and others that were strapless/tank style..I have been doing a lot of research and many things I’ve read said to not expose shoulders/chest/and legs above the knee.. in your experiences, was it okay to wear “revealing” clothes there? I am very glad that you liked it and found it helpful! I am very fond of my travel guides because I love to think back of the amazing time I had there! 🙂 I hope you have the most wonderful time on your trips!!! Wow, tolle Eindrück & Bilder Leonie! Ich war selbst im September dort und schreibe gerade an einem Guide. Marrakech ist für mich fast jedes Jahr einen Trip wert und sei es nur ein Wochenende. Immer wieder zauberhaft! Danke, meine Liebe! Ich möchte auch unbedingt wieder nach Marokko und das Land noch besser kennenlernen! Hi dear, I would say that it depends a lot on where exactly in Morocco you are. Obviously, if you are within your hotel area you can decide more freely what you want to wear. Also Marrakesh for example was rather touristy and seeing some skin there was not that unusal. However, this is probably different in cities with less exposure to tourism. I always have a scarf or something alike with me to cover myself up if I go to a place where it seems more appropriate! Have fun on your trip, I am sure it is going to be amazing!!!! I just came back from Marrakech a few weeks ago, so looking at your gorgeous pics made me reminisce 🙂 Its such a vibrant place, and the food was to die for. 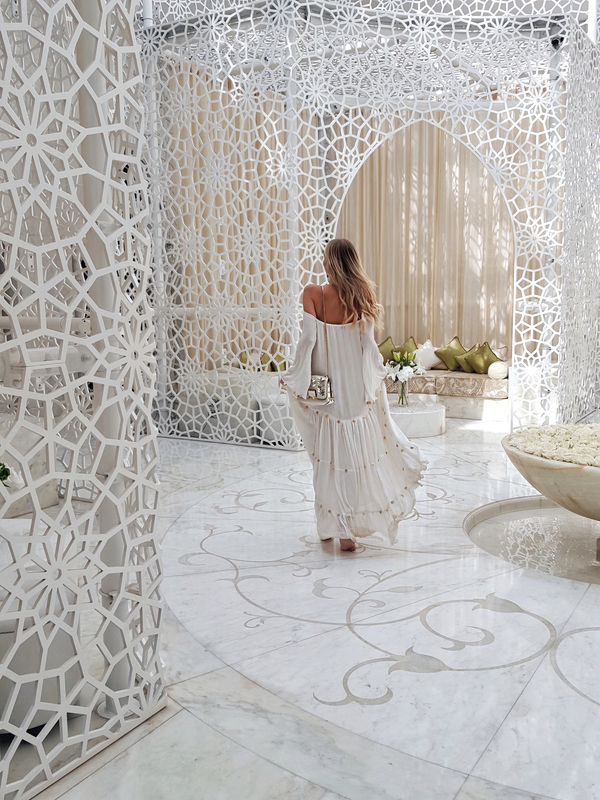 La Mamounia is definitely on my hit-list for next time! Lucky you! I’d love to go back soon! Hello! My name is Cynthia from Philippines. I saw your photo on instagram and I told my boyfriend that I want to have a photo exactly where you’ve been and there, he found your blog:) Thanks for sharing about Marrakech. I’m following your footsteps, Going to the same place you have been. I’m travelling for Morrocco on the next day. And if I will be able to take that sunnies with me, it’ll be in a summer time in British Columbia, Canada! ? I am glad you found it helpful! I hope you’ll have an amazing time in Morocco! I’M sure you will love it! Thank you for the beautiful! Beautiful post! Hi! I have been following your Instagram and love it. 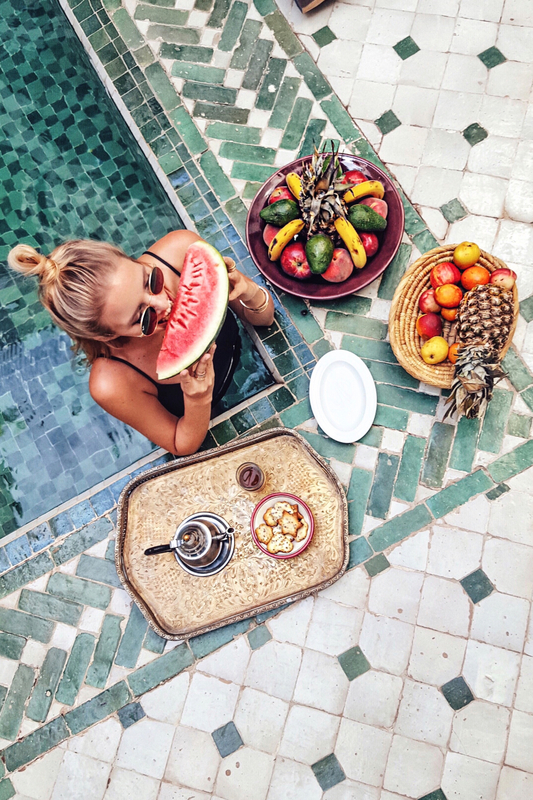 I am looking for the two swimsuits that you wore in your Marrakech trip – the black one piece (with low back and criss cross) and the white one piece (with low back). Can you let me know where to get them? They don’t look like the ones in the links. Thank you!! Hope to see you also in Ryad Dyor ! Will you please share where your dresses are from in this blogpost. Your black one with stars and also long white one, off shoulder you had in Ben Youssef and the blush off shoulder one. 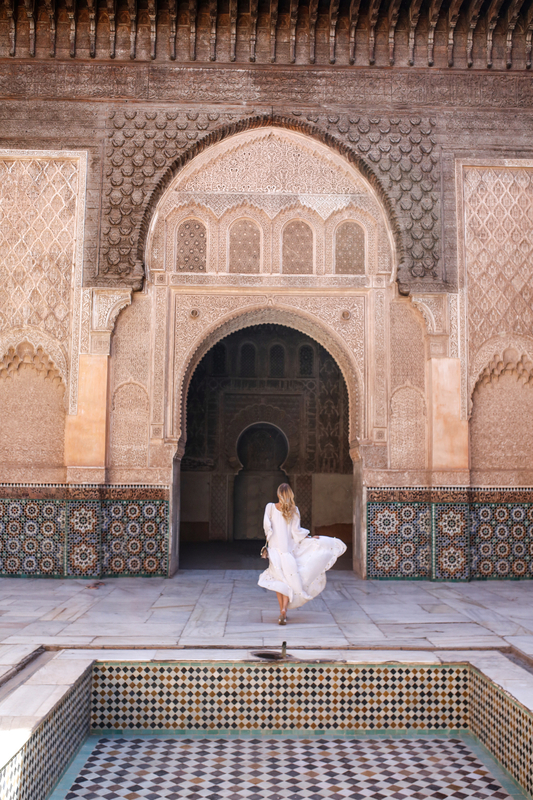 thanks for posting this usefull article about travelling to Morocco! it’s full of useful information! I appreciate your effort to make this a magical place to visit. All the places you mention are awesome and looks very beautiful. Marrakech has been on my bucket list for a while and I have dropped it at the last minute for no good reason. But your post has made me wanna pack my bags and fly to Marrakech. Since been a solo travel, I hope to it seems to be safe. Thanks for the tips of the places in Marrakesh! I would have loved seen it before my trip. A place you must go when you go back is Dar Yacout, is a restaurant with a close menu of Moroccan food super delicious! I loved it! I will go back to Marrakesh and will go to those riads! Your blog is absolutely amazing!! I was wondering if we can visit all of the riads or we absolutely have to stay there? wow ,Beautiful pictures., Marrakech is a stunning city.. 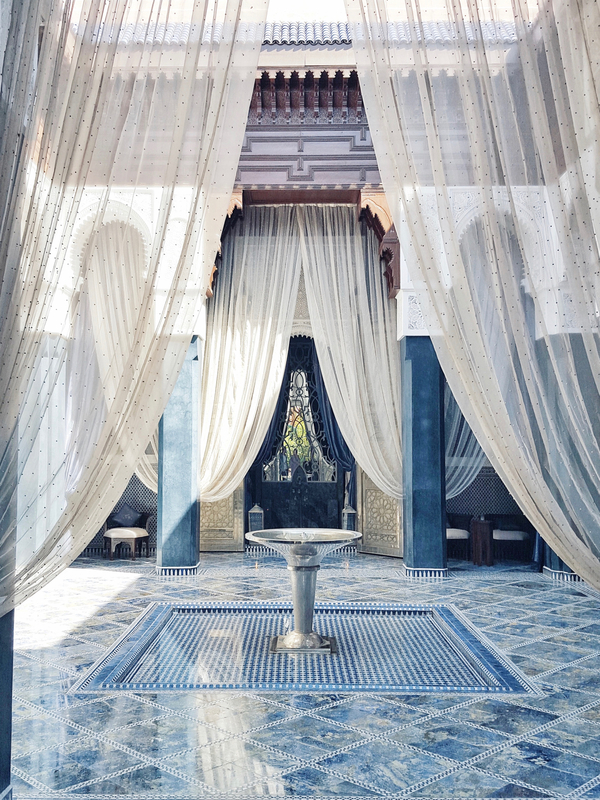 I would definitely include staying in Ryad in my next visit to Marrakech . Thanks for the article! Marrakech is the beautiful city in Morocco. 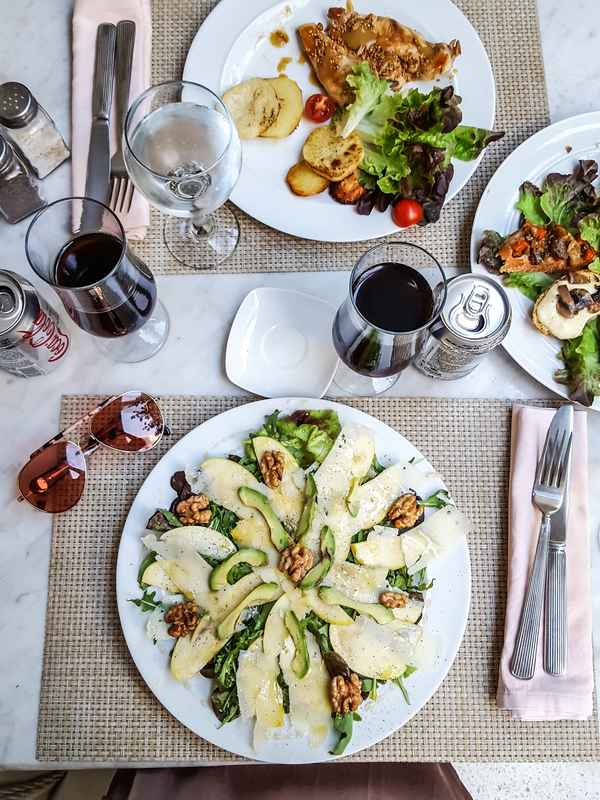 In this city, You can so many places like Riad Berber and also you can enjoy the food. and also enjoy the journey. Thank you to posting the incredible post.